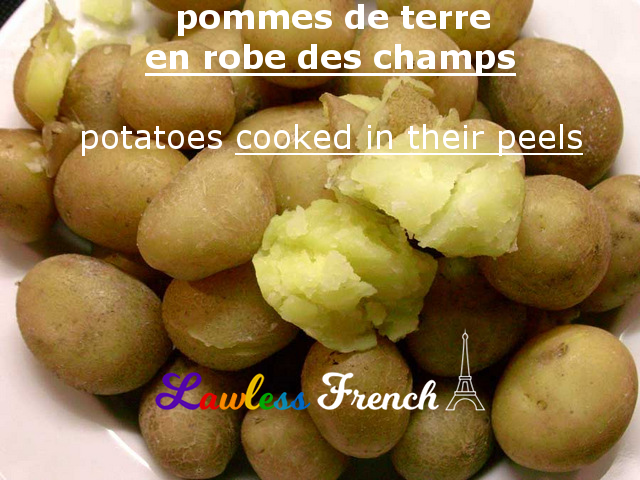 Usage notes: The French expression en robe des champs is a lovely way to describe potatoes cooked in their peels, whether baked, steamed, or boiled. There’s no real equivalent in American English. British English has the cute expression “jacket potatoes,” but that refers specifically to baked potatoes – and isn’t as poetic as en robe des champs anyway. Nous mangeons des pommes de terre cuites au four en robe des champs. We’re eating baked potatoes / jacket potatoes. Je n’aime pas les pommes de terre en robe des champs. 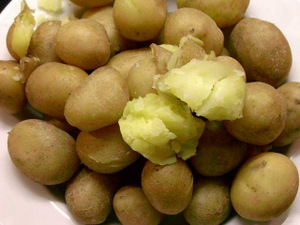 I don’t like unpeeled (cooked) potatoes. It’s most common with potatoes, but you can also use en robe des champs for other fruits and vegetables cooked with their skin on. en chemise (rare) – "in a shirt"